Horizontal hostility is a sociological phenomenon used to describe infighting or factionalism within a minority movement. Rather than banding together, subgroups snipe and fight with each other. Why do people who love Star Wars not get along with Star Trek fans? Did you know that vegans can’t stand vegetarians because they haven’t gone “all the way”? There are people within the Disney fan subculture who love Walt Disney World in Florida and refuse to go to Disneyland in California (and vice-versa)! Within the motorcycle community, there are BMW bikers who would rather walk than ride a Harley Davidson (but don’t worry…the feeling is mutual). To people outside these subcultures, these differences seem almost comical or trivial. But to the people in the midst of these communities, the differences are huge and define who they are. In fact, as these subcultures become more enthusiastic and entrenched in these turf wars, they end up looking more and more bizarre to the general public. In recent years, this behavior has accelerated because it is now possible for these subgroups to self-organize on the Internet. The dark side of finding a community online is that groups can continue to splinter into smaller and more passionate subgroups, having even more stringent rules defining who’s in and who’s out. This behavior is pervasive within the church too, and it’s killing us. 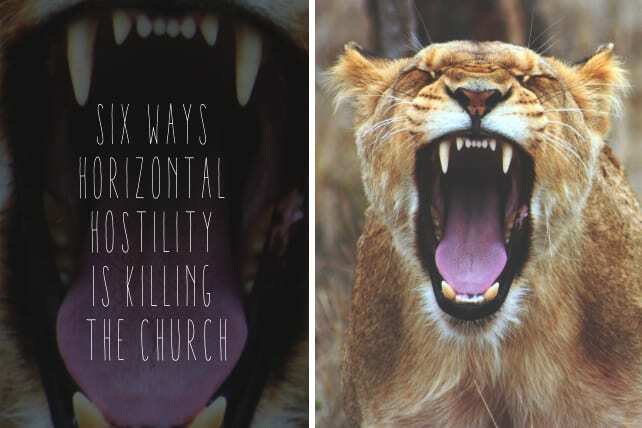 The widespread impact of “horizontal hostility” on the Body of Christ is accelerating our collective irrelevance and paving the path toward the decline of the church. Jared C. Wilson from Midwestern Seminary publicly questions Andy Stanley from NorthPoint Church and his use of the Bible. Ironically, if you compare the statements of faith from both Midwestern & NorthPoint you’ll notice striking similarities due to North Point’s leadership being drawn mostly from the same Southern Baptist circles. Harvest Bible Chapel Pastor Jacob Reaume calling out The Meeting House’s Bruxy Cavey‘s view of scripture…even going as far as to call him a false teacher. This was after The Meeting House went out of its way to affirm & celebrate Harvest and its distinctives publicly. The most shared article on the progressive evangelical site Red Letter Christians (RLC) calls into question the very term “evangelical” and whether its community still wants to be a part of that movement. Ironically, more progressive movements within the broader Christian community condemn RLC for holding on so tightly to a historical understanding of Jesus while more conservative evangelicals criticize RLC for being too progressive. It would seem like RLC isn’t at home really anywhere! All this arguing among ourselves would be interesting parlor conversation if the broader church was having widespread impact but it’s really the opposite that’s true. We don’t have that luxury anymore. Ninety-four percent of churches are losing ground against the population growth of their communities. The Church is caught in a dramatic downward spiral and rather than banding together, we’re scattering farther and farther apart. At the very moment when we need to see the commonality of our fellow Christ-following brothers and sisters, we’re actually fracturing into smaller and smaller subsets with decreasing impact and effectiveness. Where are the unifying voices of the church looking to find common ground among broader movements to build consensus and agreement toward the end of getting people to come into relationship with Jesus? Billy Graham unified a community of “progressive fundamentalists” who would go on to call themselves “evangelicals” and reach millions with the message of Jesus. [ref] They stood up against the fringe voices among themselves who wanted to divide and split hairs rather than accomplish their common desire to see people encounter Christ. Those days seem like distant faint memories or maybe even worse, like something off the Andy Griffith show from so many years ago. Shifted Focus – Picking on other churches is an easy and secondary target. It’s small leadership focusing on small issues. It’s taking our eyes off Christ’s final command to his first followers when he said “you will be my witnesses in Jerusalem and in all Judea and Samaria, and to the end of the earth” (Acts 1:8). His last words to us need to be our first priority. Picking fights among ourselves distracts us from what we’re supposed to be doing. Sideways Energy – If you have ever been attacked by another Christian, you know the feeling that ends up happening. It results in hours, days, even weeks of distracted conversations as you think through what is the best way to respond. It means that you end up having a bunch of thoughts wrestling through what your next response should be. Even if you end up deciding it’s not worth the effort to try to correct a brother or sister, you only reach that point after a tremendous amount of energy is exerted. Ironically, you didn’t instigate the issue, but it ends up negatively impacting your ability to work on what God is calling your church or ministry to do. Echo Chamber – If you look around and everyone in your ministry looks and sounds the same, it’s time for you to change. The Body of Christ should be the most dynamic and diverse gathering in our communities. Horizontal hostility ends up forcing us into homogeneous units that look increasingly strange to the outside world. Think about the last time you saw a religious group that all dressed and acted the same…how did that make you feel? Creeped out, right? The impact of this behavior will make our ministries blander and ultimately less effective in reaching out beyond ourselves. Operational Drag – I was trying to think of a more lofty way to say this but it’s just a waste of resources. The effort required to define the line between who is in and who is out proves to be costly. The time, effort and energy that you spend on this slows you down on your mission. It creates fuzziness in the people you are attempting to reach out to because rather than getting people to wrestle with where they are at with Jesus you are asking them to consider what they think about this other ministry. It’s a waste of effort. SEO Impact – I led in a ministry that was falsely attacked online. Honestly, the claims were baseless and I think the people making them were really just bored and wanted to take us down a notch because of the growth and impact our ministry was making. It might seem like a trivial consideration, but the long-term impact of those people’s posts and forum discussions lingered on for years in our ministry. It had real world impact as we interacted with suppliers, town officials and vendors for years to come. We ended up needing to explain these false claims to people and I’m sure it negatively impacted our ability to get some ministry work done because of it. Search engines attempt to present a balanced view of an organization so negative stories like this quickly float up in the ratings and stick around for a long time. It might seem fun for you in the short-term to take someone down a notch online, but if you love the message of Jesus, consider the long-term impact those words are going to have on a brother or sister. Can we stop thinking we’ve got it all figured out? These verses haunt me as I think about people in church leadership. Look closely at what Jesus is saying here in this passage. I wish it were more obscure and hard to understand. The fact that it is so straightforward is what makes it so powerful. Jesus is saying that there are people who are going to have amazing ministries but they are somehow doing it apart from him. That message should cause us all to walk humbly. If you read that and your mind jumps to other people who you think Jesus is talking about…repent. That’s a message for all of us to walk closely with the Lord and keep our relationship fastened to him tightly. It’s not a weapon for you to lob at that other church across town. Seriously. Jesus – He’s our example from start to finish. Before you look to take on someone else ask yourself if what you are reflecting is the Spirit of Christ. In a world that is walking farther and farther away from God…is this what will help people see Jesus more clearly? Befriend Church Leaders – Get outside your tribe. Find some Christ followers who aren’t like you. Get to know them. See them in their finest hour and celebrate with them. Get to know their dreams for the future. Pray for those dreams. Publicly Celebrate – The Kingdom of Christ is bigger than any of our individual expressions. It feels so strange to have to declare such a stunningly obvious thing like that. Take time in your services to celebrate what God is doing through other churches and ministries close to you. Bonus points for doing it for that church that people are leaving your church to go to. Ignore the Arguments – Don’t be entrapped by this red meat. Don’t feed the trolls. Rise above this and move on. Be blissfully unaware of what people are talking about. Walk away when you’re with those other church leaders and they start to poke somebody else. Repent and ask for forgiveness if you’ve engaged in it. I’d love to hear from you. Where do you see this at work? What am I missing? Where is my blind spot in this? How do I need to learn and grow?